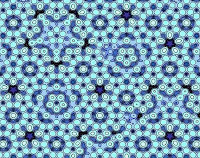 Resembling mosaic tile, this atomic model shows a type of quasicrystal, a material whose atoms display a regular but nonrepeating pattern—once thought impossible in crystals. The discovery of quasicrystals earned Israeli scientist Daniel Shechtman the 2011 Nobel Prize in Chemistry Wednesday—and joins the list of Nobel-winning chemical discoveries with the potential to change the way we live. "Quasicrystals were an unexpected state of matter when Shechtman discovered them. ... [and] there was initial resistance to the discovery," said Thomas Tritton, president and CEO of the nonprofit Chemical Heritage Foundation, based in Philadelphia, Pennsylvania. "Luckily, persistence [and] further research carried the day." Schectman, of the Technion-Israel Institute of Technology, glimpsed his first example of quasicrystals' "forbidden symmetry" in April 1982, when he was studying a metallic crystal made of aluminum and manganese under a microscope. The researcher spotted a unique diffraction pattern of concentric circles made up of ten bright dots, all at the same distance from each other. At the time, scientists thought a crystal could have only four to six such dots.